It has been a good couple of weeks since I bought you any Stokke® news - so here you have it hot off the press once again. New for August across the world you'll be able to get your hands on this lovely new bedding collection. Made from beautifully soft high grade Egyptian Cotton the new bedding is totally fab. I know that there are going to be lots of people out there saying that they don't have a Stokke® Sleepi™ but that doesn't matter at all. The Stokke® bedding can be used in any nursery and the Spotty comes in pink and blue. If you'd like a more zen option that the dotty spotty - take a look at the new Classic White, it has beautiful detailing and feels so soft and yummy. The bedding collection consists of Sleeping bags, cot bumpers, Bedlinnen (pillow and duvet) and also the shaped Sleepi™ cover and will be available from all Stokke® retailers soon. Whilst I am talking about the new textiles I should also give the Sleepi™ a mention. I love this cot. FunnyGirl had one and loved it from the moment she first went into it. To be honest I didn't think that we would use it past cot size but we so did. Off went the side when she was big enough and then we bought the Junior Bed Kit. At five she has just gone into a big bed but she still loves her Sleepi to bits. All of my other children had this thing where they went round and round in circles in their cots. We put them down facing one way and in the morning they would be in totally the other direction. FunnyGirl didn't do this once in the five years that she slept in her Sleepi. She went down easily at night and has always been a fantastic sleeper. There is something about that cot that is calming and welcoming at the same time and it really is something that is built to last. 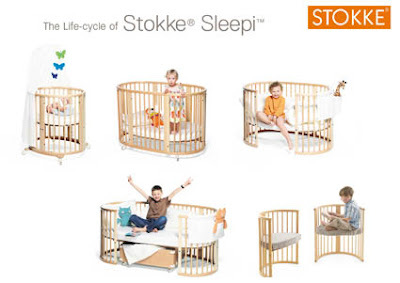 If you are looking for a crib, that can be used as a cot, a cot bed, junior bed, sofa and two chairs then i challenge you to find anything to match the beautiful Stokke® Sleepi™. I adore this new textile too, Its amazing! I have the FULL circles pink set, but this new design really makes me want to revamp my daughters Sleepi and get her ALL of the dotty bedding!